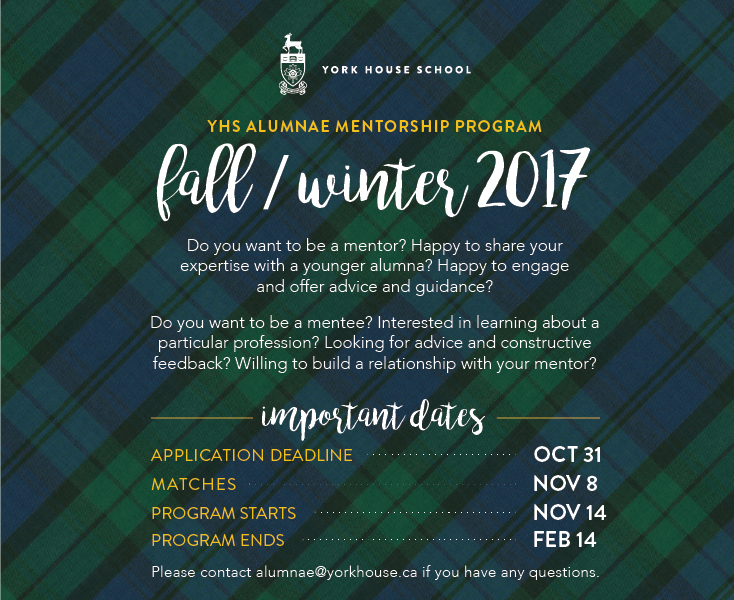 The YHS Alumnae Mentorship program was launched last September and the feedback has been very positive from both mentees and mentors. We asked Ashley Williams ’12 and Salima Remtulla ’00 about their experiences. Ashley, you were matched with mentor Shannon Trainor from the Class of 2005. Tell us about your experience and why you wanted a mentor? I got involved with the Alumnae Mentorship Program because I wanted to learn as much as I could from a Yorkie who had gone through a similar university experience. I also wanted advice for upcoming interviews for medical residency in Canada. 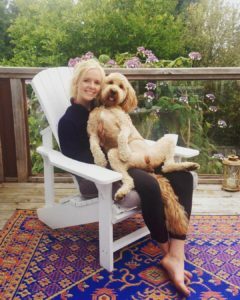 It was a very worthwhile experience because Shannon gave me excellent advice about how to prepare for interviews and shared her own experiences as a medical student studying abroad. Ultimately, I felt very supported by Shannon’s empathy and genuine interest in guiding me through my residency interviews. Did you feel comfortable connecting with her? It was effortless to connect with Shannon as she was very friendly and easy to talk to. She always left the door open for questions and future meetings. We arranged our meetings in a flexible way that suited both of our busy schedules. How did she help you with your career journey? In terms of my career journey, Shannon helped by giving me some questions to reflect on as I was going through my interview process. She gave me wise advice from her own residency experience and this helped me decide which jobs were better suited to my future plans. She also gave me a good list of interview questions to practice answering on my own or with family and friends. Shannon and I arranged our first meeting on FaceTime. We then corresponded mostly by email and we also met for lunch when I was back in Vancouver. I hope to stay in touch especially since we are both in family medicine! Do you think it’s important for recent grads to find a mentor? 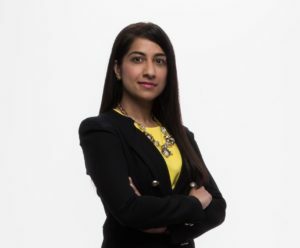 I believe it is important as it can be difficult to navigate career options post university and so connecting with someone who has been through a similar experience provides reassurance. It is helpful to have someone to talk to who is objective to your experience because they might point out options or ideas you hadn’t thought of before. Finally, in a technology-run world, I think it is crucial to keep cultivating genuine human to human connections, which this program achieves. Salima, as a mentor, you were matched with Skylar Gordon, Class of 2014. Tell us about that experience. There was so much I gained from the experience – a new friend, a stronger connection with York House, the opportunity to reflect on some of the key decisions I’ve made in my own life as Skylar and talked through crossroads she’s navigating, fresh insights into current events, knowledge of the start-up scene here in Vancouver (and a delightful tea company in particular! ), the list goes on. I’m looking forward to building on my relationship with Skylar now that she’s moved back to Vancouver, and am also excited about getting to know the new Yorkie I’ve been matched with in the second cycle of the YHS Alumnae Mentorship Program! Why do you think it’s important to be a mentor? None of us got to where we are today without help – whether it be from friends, family, teachers, colleagues, mentors, or others. Mentorship is about paying the kindness we’ve received forward so that we each lift as we climb. As women, mentoring is even more critical, as the ‘gender confidence gap’ is very real. To change the face of leadership, we need to encourage other women to set their sights higher and act with the self-assurance we wish we had ourselves. Have you had many mentors throughout your own career to date? Too many to count! And what the most impactful ones had in common was that each of them believed in me more than I believed in myself and pushed me to take risks, do better, and ask for more. All of us struggle to some degree with self-doubt – the more people you have in your life who think you’re more capable and amazing than you give yourself credit for, the more confidence and support you will have to take leaps, and grow. Are there any tips you can give other alumnae wanting to be mentors? Mentees give great advice! When we don’t actively seek out different perspectives, each of us tends to operate in an echo chamber. Consider how your mentee can offer you a fresh perspective on something you hold long-established beliefs about, or how they can help you understand a new trend (hashtags, anyone?). Skylar and I had a fantastic conversation about “Millennials” in one of our early meetings that fleshed out both of our understanding of generational biases – which run both ways! – and how workplaces and corporate cultures are shifting to address the needs of an increasingly purpose- and impact- oriented next generation. Have you any advice for young graduates looking for mentors? The hardest part is often figuring out what you want. Once you’ve identified what you want from a mentor (Help navigating a big decision? Career advice? Life advice? An introduction? ), then do some research to figure out who might be able to give you what you’re looking for (Someone in your workplace? An expert in your field? A former Yorkie? ), and ask! I have yet to experience someone turning me down point-blank when asked for something I know they are able to offer – sometimes they’ll ask for some timing flexibility, other times they’ll refer me to someone they think is better able to help, but I always walk away with something! Similarly, I strive to pay that forward and give something whenever it’s asked of me.